HomeLifestyleFashionIs Gigi Hadid Wearing Blackface On The Cover Of Vogue Italia? It’s 2018: Why are we still seeing blackface? That’s the question we asked ourselves Wednesday when we saw that Vogue Italia shared a sneak peak on Instagram of its May cover, featuring Gigi Hadid. That the 23-year-old model was shot for the magazine was nothing new. But we have to admit, Hadid looked a little…different. Although the Steven Klein -lensed image evokes Vogue Italia’s expectedly edgy aesthetic — and Hadid looks regal in a sequined Dolce & Gabbana jumpsuit — commenters were quick to call out how noticeably darker her skin appeared to be. And we think they have a point. “Not that @gigihadid is not a beautiful powerful model and not that it is not a nice cover… but as you wanted to have a darker skin model shouldn’t you have just chose a dark skin model ? ?‍♂️” @youssefbouabid posted on the magazine’s Instagram account. 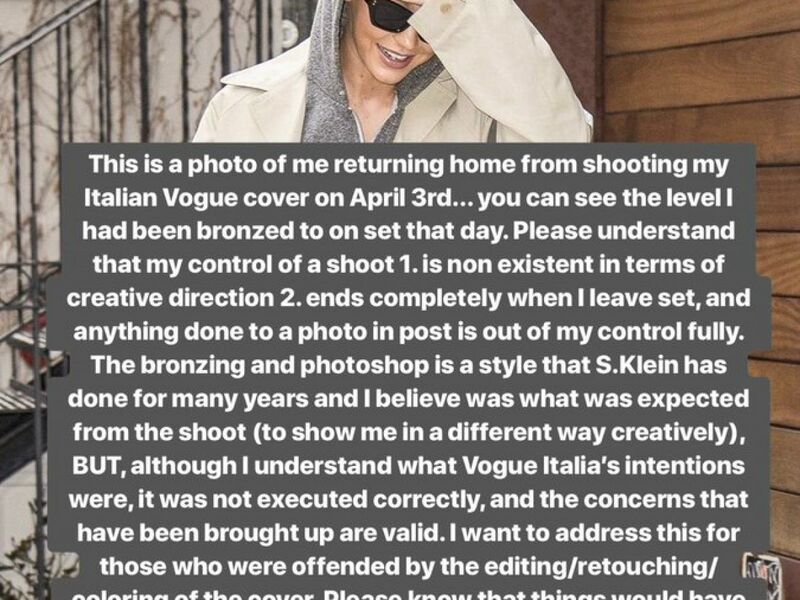 User @liamliangl i was also upset, writing: “I would say this is a new low for Vogue Italia…pretty sure there are much more models who deserve this more than she does. And the photoshop lol…” But the question of whether or not this is considered blackface is incredibly valid — and a claim that isn’t foreign to either Vogue Italia or Steven Klein. In 2006, Vogue Italia published a 10-page spread featuring two white models who were made to look like Black women. (Klein was also the photographer). For its November 2015 issue, Steven Miesel photographed Hadid wearing an afro wig; her skin was darkened with so much bronzer that she looked Black (sound familiar?). Either way, it feels like after that backlash — and when you factor in the fashion’s industry’s continued issue with racial diversity — all parties involved (Hadid included) should know better. Blackface still carries an incredibly hurtful and damning stigma, and why the fashion industry still doesn’t understand that is beyond us.